The holidays certainly don’t help, when it comes to eating clean. As family starts coming into town, most people find themselves eating out several times a week. Not only does this get expensive but it also puts maintaining your Heart Smart Minute fitness and nutrition plan extremely difficult. Restaurants care about making their food tasty so customers continue to come back, great for them, bad for your waistline. Food is often sautéed in butter and oil to add flavor. Seasonings are full of sodium, most often an entire day’s worth in a single meal. The biggest Heart Smart Minute nutrition secret I can give you to combat holiday restaurant eating is this: most restaurants have menus online with calorie counts. Don’t go in blind, know where you’re going and what you’ll be eating before you get there. When you know the calories of the food you are 85% less likely to over consume calories! Here are 5 huge restaurant mistakes I see people making every time I’m out. LOVING THE OLIVE OIL: Okay, it’s true, olive oil is great for your heart but it’s not meant for bread to be dipped in. Just 2 slices of dipped bread adds up to almost 400 calories which is 90% of what a female should be eating for a meal and 75% of a male’s calories. Bread is like a sponge and soaks up much more olive oil than you notice. Use EVOO for cooking but cut it with Balsamic Vinegar to reduce calories and add flavor. GARLIC AND OIL VEGGIES: This is the right idea, executed the wrong way. Great job on picking veggies over fries but garlic and oil is a no no. Garlic is great alone but never get sautéed veggies. Remember, the cook wants you to come back, so to make those veggies extra tasty you’ve getting hundreds of extra calories and fat. Ask for veggies to be cooked DRY, meaning it’s steamed with NO SALT, OIL or BUTTER. HEALTHY SALAD: This one is so difficult to judge because you really want salad to be healthy, and it’s meant to be, when you’re making it at your home. Watch for the code words of CHEESE, CANDIED WALNUTS, DRIED CRANBERRIES, BACON, and so on. Less is more when it comes to salad. Ask for healthy fat like avocado and stick to cucumbers, tomatoes, and chopped egg whites. ORDER TAPAS STYLE: Small plate appetizers is not a great idea for your meal. Small plates cause more eating because you’re never really full. Also going from plate to plate makes you unaware of what you are eating. If you’re getting a bunch of appetizers to share, make sure you focus on protein and veggies. This way you’ll get fuller, longer and never eat fried food. SWEET POTATO FRIES: The biggest myth out there is that sweet potato fries are less calories and healthier for you than regular fries. This is so FALSE. Sweet potato fires are often MORE CALORIC than their counterpart. It is often topped with salt and cinnamon to increase the flavor and fried in the exact same way as regular fries. There is nothing good for you about sweet potato fries so stop fooling yourself. It’s okay to prefer it over regular fries but don’t expect it to be a healthier option. 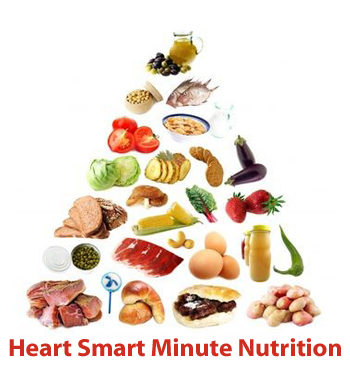 Follow us on Facebook for more Heart Smart Minute Nutrition and Fitness tips! This entry was posted in Heart Smart Minute and tagged calories, health, Heart Smart Minute, Heart Smart Minute Nutrition, Water, Weight Loss. Bookmark the permalink.